This month, I’d like to share my mother’s recipe for chocolate biscuit pudding. A very popular dessert in Sri Lanka, chocolate biscuit pudding is an easy-to-make, delicious dessert that can handle different variations to its layers. As I enjoy my slice of the pudding today, I wish you all a merry Christmas and Happy Holidays! Mix icing sugar and butter. Add the chocolate milk slowly until the mix becomes creamy. Soak the biscuits in plain milk and line the pyrex dish or dessert pan with a thickness of two biscuits. Spread the cream over the base layer and sprinkle some of the chopped nuts. Add another layer of biscuits soaked in the plain milk and repeat the process of adding the cream and nuts. The biscuit pudding can have as many layers as you want but 2-3 layers are good. Spread the remaining cream on top of the dessert. Decorate with strawberries. Refrigerate for a minimum 30 minutes before serving. This week’s recipe is from Trevor Martil, who shares another of his mother’s favourite recipes – a dessert she named ‘surprise delight.’ I am bringing this recipe together with some lovely songs, from a country I visited three years ago, to Fiesta Friday. While there were several highlights of my trip, the most inspiring was the visit to Robben Island. And yes, I was also introduced to some south African music while there. Today’s music features some of the South African music that I enjoyed starting with Mama Afrika – Miriam Makeba. The other clip for today is from the Soweto Gospel Choir. Mix cake crumbs with mixed fruit jam, cashew nuts and press into shallow dish. Leave to set. Add cordial, water, corn flour, gelatin to a pan and cook till it thickens. Take off heat, add condensed milk and stiffly beat in egg whites. Mash mixed fruits, spread over cake crumbs. Pour the cordial custard over it. Once set, chop the jelly and spread it over the custard. 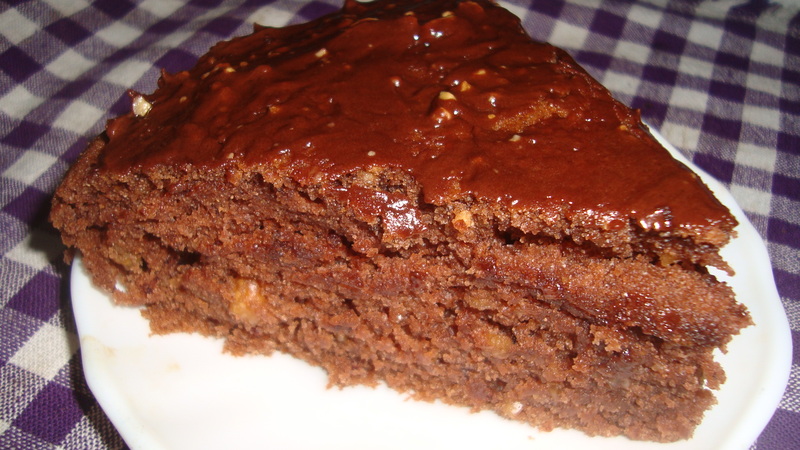 Today, I wish to re-post a delicious chocolate cake recipe of my mother that I had posted last year. Today’s music features Arabic pop. The first clip is a song, by Samira Said and Cheb Mami, that has special meaning to me. Sometimes when I am stuck in my writing process, I turn to music to clear my head and focus. The type of music that helps me at one time does not necessarily help at another time so I usually experiment with a few before I come across the right one for the particular writing. One of the times I faced a writing block was during the writing of my master’s thesis. After several non-productive days and many music listening hours later, I found myself listening to an online Arabic pop radio stream. From the moment, this song came on, I felt very much energized and focused and soon started working on my writing. This was the song that pulled me through the subsequent weeks of thesis writing and as such, I retain a fondness for it. The next clip is a recent release of Diana Haddad, another Arabic pop singer that I used to listen to. Have a wonderful day and enjoy this cake! Sift the dry ingredients – the wheat flour together with the cocoa powder, baking powder and baking soda – and keep aside. Mash the banana in a bowl. Add the margarine and sugar to the bowl and whisk them together. Gradually add the soya milk and continue whisking. Stir in the coarsely ground peanuts and vanilla essence. Pour the cake batter into a greased tray and bake at 190⁰C/374⁰F for 40 mins. Whisk 1 tbsp margarine together with 1 tsp cocoa powder, 2 tbsp icing sugar and 2 tsp ground nuts to make the frosting. Spread evenly on surface of the peanut chocolate cake, after the cake has sufficiently cooled.